David Federman, Modern Jeweler, Nov. ‘96. Our Ramaura™ Cultured Rubies, Nicholas Created Alexandrites and Empress Cultured Emeralds are thrilling the public and enriching jewelers. Our gemstones put smiles on their owners’ faces and a satisfied certainty that they purchased the best the world has to offer. The Ramaura™ Cultured Ruby represents science at its very best. Using a technique that mimics nature, we create a ruby that is astonishingly like natural ruby, inclusions and all! Since 1983, when Judith Osmer started the J.O. 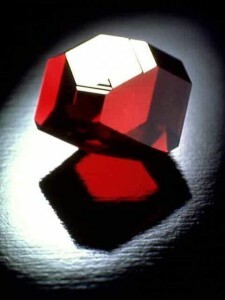 Crystal Co., gemologists voiced concern over the difficulty of telling Ramaura™ from natural ruby. The result is that every Ramaura™ has a tiny identifier built into its chemistry to aid gemologists in its identification. The folks at National Geographic were so impressed they featured the Ramaura™ on their TV Special “Splendid Stones”. You may never have seen a really good ruby until you see a Ramaura™ Cultured Ruby. In romantic settings with low levels of light, they sparkle and gleam with all the beauty promised by the word “ruby”. Companion products, the Nicholas Created Alexandrite and Empress Cultured Emerald are also top of the line gems suitable for use in fine jewelry. The Nicholas makes an almost total color change as it is moved from interior lighting to sunlight and the Empress has that blazing green that enchants emerald lovers the world over. Our quality is the best and our prices are competitive! We have thousands of gems (calibrated and uncalibrated) in stock. If needed, we can get your selections to you in 24 hours.